series Peyton Place , 1967; starred in Unhook the Stars , directed and co-scripted by son Nick Cassavetes, 1996; had a small role in She's So Lovely , directed by Nick Cassavetes from a script by John Cassavetes, 1997. Awards: National Board of Review Best Actress, San Sebastian International Film Festival Best Actress, Best Motion Picture Actress-Drama Golden Globe, for A Woman Under the Influence , 1974; Berlin Film Festival Best Actress, for Opening Night , 1978; Italian Silver Ribbon for Best Foreign Actress, for Love Streams , 1983–84; Outstanding Lead Actress in a Miniseries or a Special Emmy Award, Best Performance by an Actress in a Mini-Series or Motion Picture Made for TV Golden Globe, for The Betty Ford Story , 1987; Outstanding Lead Actress in a Ministries or a Special Emmy Award, for Face of a Stranger , 1991; Natuional Board of Review Career Achievement Award, 1996. Address: 7917 Woodrow Wilson Drive, Los Angeles, CA 90046, U.S.A.
"Gena Rowlands Is Gloria," interview with Rob Edelman, in Films in Review (New York), October 1980. Interview with T. Jousse, in Cahiers du Cinéma (Paris), June 1992. Interview with Gary Indiana, in Interview (New York), December 1992. Tremois, C. M., "Portraits of Gena Rowlands," in Avant-Scene Cinema (Paris), June 1995. Murat, Pierre, "La bible de néon/'Je n'aime pas les coeurs secs," in Télérama (Paris), 23 August 1995. "Mississippi Yearning," interview with Geoff Andrew, in Time Out (London), 4 October 1995. Webster, A., "Filmography," in Premiere (New York), May 1998. Current Biography 1975 , New York, 1975. Farren, J., "Gena Rowlands," in Cinéma (Paris), February 1977. Walker, Beverly, "Woman of Influence: Gena," in Film Comment (New York), May/June 1989. Sight and Sound (London), October 1995. Weisel, A., "Night of Shooting 'Stars,"' in Premier (New York), November 1996. Jones, K., "Her Brilliant Career," in Village Voice (New York), 10 December 1996. Darke, C., "In the Name of the Father," in Sight and Sound (London), July 1997. 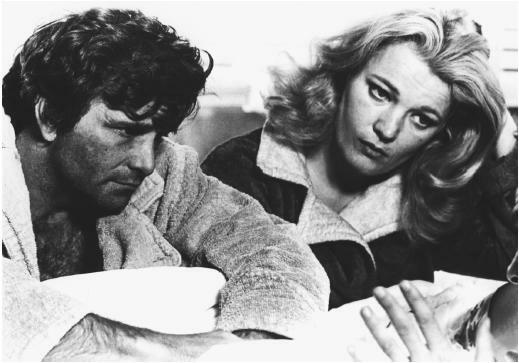 Although Gena Rowlands made her film debut in 1958, she seemed to burst fresh onto the cinema screens with the 1968 release of John Cassavetes's Faces. Under the direction of her husband, she gave a performance of startling intensity as Jeanni Rapp, a prostitute who spends an evening with an errant husband played by John Marley. Over the next 20 years, Rowlands's career was inextricably linked with that of her husband. She starred in an additional five films he directed, including three in which he co-starred; in 1982, they played husband and wife in Paul Mazursky's Tempest. Unlike any other director with whom Rowlands has worked, Cassavetes was able to successfully tap into the actress's ability to depict a wide variety of female experiences, particularly playing women at extreme points of stress. Three years after the release of Faces , Rowlands appeared in Minnie and Moskowitz as Minnie, a lonely, former prom queen about to turn 40 who, after being dumped by her married boyfriend (Cassavetes), takes up with Moskowitz, an aging hippie who works as a parking lot attendant. Then, as the tortured housewife Mabel Longhetti in A Woman Under the Influence , Rowlands garnered her greatest critical reviews, her depiction of a lower-middle-class woman's struggle to maintain sanity striking a resonant chord with many viewers and critics. Sadly, Mabel lives her life through her husband and children; according to Rowlands, Mabel was "totally vulnerable and giving, she had no sense of her own worth, and was completely mirrored in the eyes of men." In an intensely physical performance, Rowlands convincingly depicted the erratic behavior of a woman who finds she cannot always express herself in words. Mabel struggles valiantly but ineffectually with her psychological condition; never does Cassavetes romanticize her martyrdom. Made at a time when challenging, fully-developed roles for actresses were becoming increasingly rare, A Woman Under the Influence (along with An Unmarried Woman , starring Jill Clayburgh) stands as a beacon amid a vast wasteland of onedimensional women's roles as mothers and whores. The next Cassavetes-Rowlands collaboration— Opening Night —had Rowlands playing Myrtle Gordon, an unmarried actress on the verge of a nervous breakdown, who attempts to come to terms with her private life through her theatrical career. It just so happens that she is undergoing a crisis of confidence while playing a woman who is facing the same situation. Here Cassavetes also plays the dual role: Myrtle's former lover in real life, who also plays opposite her on stage. Then, beginning with a statement that Rowlands made to her husband about her desire to work with a child, came the script of Gloria. As a hardened ex-showgirl and former girlfriend to a Mafia boss, Gloria is living on her own, with, as she claims, her own money and her own apartment. That is until her neighbor squeals on the mob and Gloria is left holding his son and the book of evidence his father had compiled. Gloria walks tough; Rowlands explained that much of the power of her performance was communicated in the way she carried herself as she moves about on the streets of New York. According to her, it was a walk that said, "They'd better watch out." Ultimately, Gloria is a trapped woman; she admits she hates kids, yet in following her code of what is right, she protects and eventually develops a certain motherly responsibility to this six-year-old Puerto Rican orphan. Lines of dialogue such as "I'm saving your life, stupid" encapsulate her confusion. Throughout, Rowlands never hedges in her meanness, despite the well-known acting school dictum that you must never be mean to kids or old people. Their final project— Love Streams —is perhaps Cassavetes's most successful film. As brother and sister, Rowlands and Cassavetes depict characters going through individual crises, she of divorce and custody, he as a writer in the throes of researching a book on prostitution. Ultimately, Rowlands's Sarah loves too much, particularly those who are less fortunate than she; she herself has recently been incarcerated in a mental institution. She desperately tries to prove that she is happy, and can function on her own. Sarah and Robert meet up and through several tumultuous scenes, reawaken childhood affections. It is unfortunate that Rowlands no longer has Cassavetes to direct her, for very few others have tapped into her unique capabilities. In 1988, just before Cassavetes's death, Woody Allen directed her in his Bergmanesque Another Woman , about a writer coming to terms with her life; the role was very much the kind Bergman wrote for Liv Ullmann. Unfortunately, the project lacked the piercing insights that mark Bergman's work, and Rowlands was never fully able to plumb the depths of the character. One of Rowlands's most incisive performances outside her work with Cassavetes was as the mother dealing with her son's AIDS in the television movie An Early Frost. Here, her character, at a point in her life of extreme stress, compassionately acknowledges her love for her son. But her best 1990s role was in Terence Davies's The Neon Bible , cast as Aunt Mae, a blowsy swing band singer and aging Southern belle who comes to live with her young nephew and his family in a small town. Mae, like a character out of a Tennessee Williams play, fills the boy's ear with colorful stories, but beneath her surface bravado is a melancholy soul; she is like the forlorn subject of one of the blues songs she sings, as she goes on to impart her feelings and vulnerabilities to her nephew. In the late 1990s and well into her sixties, Rowlands busily worked in various theatrical and made-for-television features—and added character and class to them all. She excelled as Sandra's Bullock's eccentric small-town Texas mother in Hope Floats , and was well-cast as Sean Connery's long-time mate in Playing By Heart. She still carried the Cassavetes banner, appearing in a bit role in She's So Lovely , directed by son Nick Cassavetes from a script by her late husband. And her most telling role—one that is a notch below her Aunt Mae—came in Unhook the Stars , a slice-of-life directed and co-scripted by her son. Here, Rowlands offered a finely modulated performance as a well-off sixtysomething widow who becomes immersed in the lives of a troubled neighbor and her young son while attracting the romantic interest of a French-Canadian truck driver.